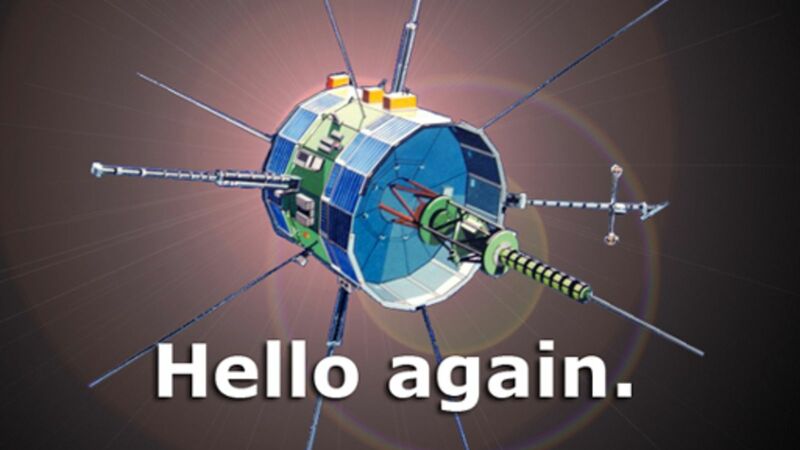 It’s official: ISEE-3, the 36-year-old satellite that NASA left for dead over a decade ago, is back in touch with humankind. This afternoon, a group of citizen scientists who raised almost $160,000 to fund the process of taking control of ISEE-3 announced that two-way contact has been established with the little satellite that could. So what’s next? “Over the coming days and weeks our team will make an assessment of the spacecraft’s overall health and refine the techniques required to fire its engines and bring it back to an orbit near Earth,” explained the Reboot team in a triumphant comment released today. Contact was made at Arecibo Radio Observatory in Puerto Rico, where scientists collaborated with a worldwide network of like-minded space fans to fund and engineer the project. Now comes the fun part: Getting ISEE-3 back to the business of studying space. We’ll have more updates as they come. Yesterday evening, NASA officially granted permission to a group of scientists and enthusiasts who want to do what NASA can’t afford: Make contact with a 36-year-old satellite called ISEE-3 that’s still capable of taking directions for a new mission. It’s the first agreement of its kind—and it could hint at where the space industry is going. So, a little back story. As our sister site io9 explained last month, ISEE-3 was launched back in 1978 to study the relationship between the Sun and Earth. It enjoyed many more missions over the next three decades, but NASA officially cut the cord in 1997. Still, ISEE-3 kept on trucking. It wasn’t until a decade later that NASA discovered she was still at it, despite the lack of commands from her benefactors at NASA. Why not send her on a new mission? Well, that’s the trouble: We have no way of communicating. The antenna used to contact ISEE-3 had been removed. Enter the group of scientists including SkyCorp, SpaceRef, Space College Foundation, and others. They want to use a different antenna, at Morehead State University, to contact ISEE-3. “Our plan is simple: we intend to contact the ISEE-3 spacecraft, command it to fire its engines and enter an orbit near Earth, and then resume its original mission,” said Keith Cowing, a former Nasa engineer and owner of Nasa Watch, told the Guardian. The ISEE-3, (later ICE), undergoing testing and evaluation. We need to initiate a crash course effort to use ‘software radio’ to recreate virtual versions all of the original communications hardware that no longer physically exists. We also need to cover overhead involved in operating a large dish antenna, locating and analyzing old documentation, and possibly some travel. If there was any doubt about whether modern Americans were still enamored with space, the results of their crowdfunding campaign squash it. The group blew through their $100,000 goal, and are currently getting close to a $150,000 stretch goal. There are only two days left to donate—and you should—but the fact that they’ve raised so much money in so short a time is remarkable. The ISEE-3 Reboot mission patch. Yesterday, NASA announced it has signed an agreement with the group called a Non-Reimbursable Space Act Agreement (NRSAA), which is a contract it signs with its external partners to describe a collaboration. It gives the group the green light to go ahead and make its attempt at taking control of ISEE-3—it essence, it gives Skycorp the right to take over the operation of a satellite that NASA built almost 40 years ago. The intrepid ISEE-3 spacecraft was sent away from its primary mission to study the physics of the solar wind extending its mission of discovery to study two comets. We have a chance to engage a new generation of citizen scientists through this creative effort to recapture the ISEE-3 spacecraft as it zips by the Earth this summer. It’s an incredible development—and it tells us something about where space travel and research is going. NASA and other state-funded research entities are being strangled by downsized budgets, but the push into space amongst independent scientists, engineers, and citizens is booming. As Elon Musk sues to let commercial space companies compete for government contracts, students and scientists are launching their own satellites. Over the next few decades, plenty of other NASA-built spacecraft will begin to age—just like ISEE-3. And unless something drastic changes about NASA’s budget, it may not have the cash to keep them up. Imagine a future in which craft built by NASA in the 70s, 80s, and 90s, are inherited by independent groups of scientists and space companies who take over operations, just like Skycorp is. The privatization of space might not be so far away—and NASA might play a heavy role in its creation.